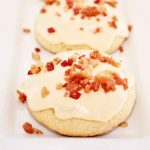 Bacon cookies are the perfect mix of sweet with salty. You really must try this recipe just one time. I think you will be hooked! Sugar cookies made from scratch topped with homemade caramel icing and sprinkled with bits of bacon. Now doesn’t that sound like heaven? Lightly grease a cookie sheet or use parchment paper to cover. In a large mixing bowl, mix all of the cookie ingredients. Then mix and fold dough. Make sure that all ingredients are well blended. Form a large ball of dough. Spoon out dough and then make small dough balls, about 1 to 1 1/2 inches. Place these on your prepared cookie sheet approximately two inches apart. Then just lightly press down on each ball to flatten slightly. In a sauce pan, bring butter, brown sugar, and milk to a boil. Then cook on low heat for 2 minutes. Do not stir. Then stir in powdered sugar and vanilla. Beat with mixer until thickened. If your mixture is too thin, you can add 1/4 cup of powdered sugar. 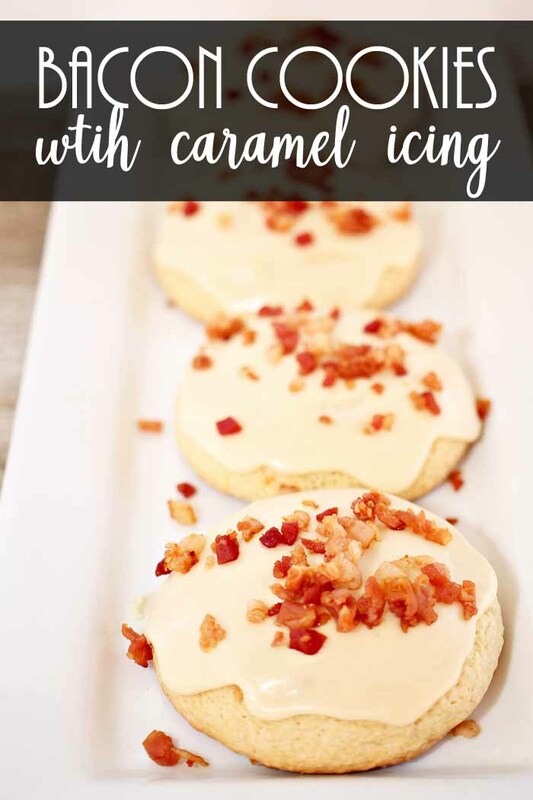 Ice your cookies and then sprinkle with bacon bits. 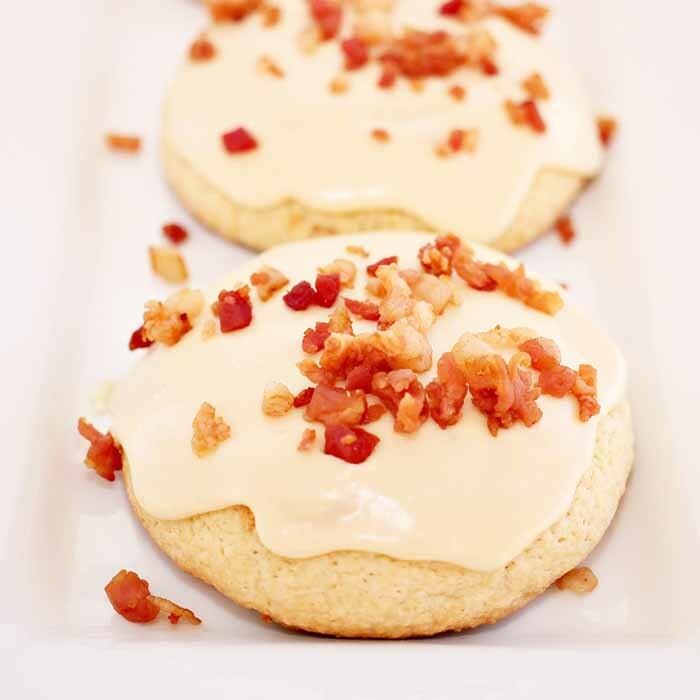 Dive into a plate of bacon cookies for any occasion you might be celebrating. Me? I tend to celebrate Mondays. I mean….why not? 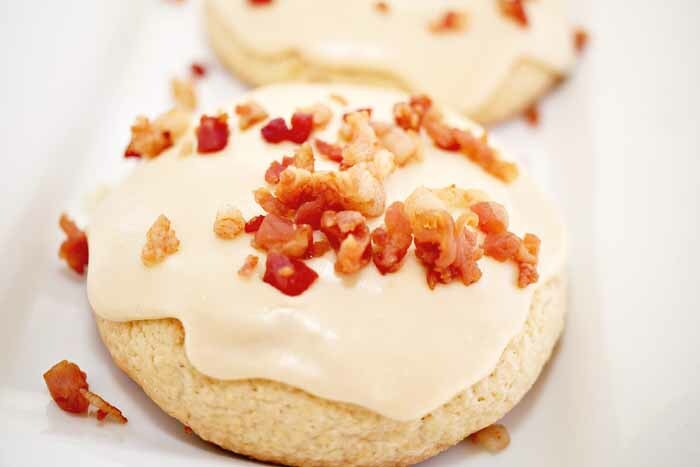 With bacon cookies, every day is a holiday! Love this recipe and want more ideas? Try the cookie recipes below! Whoah! Can you put bacon in cookies? This is a great innovation, definitely trying this right away. please don’t stop posting more recipes!